Each year, every Sea Scout Ship is supposed to hold a long cruise or a super-activity spanning at least a week in length. The long cruise or super-activity is the highlight of the Sea Scouting year and much of the Ship's quarterdeck meetings involving the planning and review of the year's long cruise or super-activity. Sea Scout Ship crew members and officers who complete cruises of at least fifteen (15) days qualify for the Sea Scout Long Cruise award. At the Skipper's discretion, that fifteen-day period can be earned in shorter cruises that are added together to satisfy the fifteen-day requirement. A Sea Scout must have attained the rank of Ordinary Seaman prior to earning the Long Cruise award. Adult leaders are also eligible for the Long Cruise award and can commence accumulating the necessary cruises at any time. The Long Cruise Award badge consists of a round circular emblem depicting a fully-rigged sailing ship on the open ocean. Sea Scouts wear the Long Cruise Award badge on their left sleeve just below their position patch, if any, on their dress white or dress blue uniform. Subsequent long cruise awards are marked by the addition of a red arc placed on top of the Long Cruise badge with a white arc signifying five (5) additional Long Cruise awards. 2013 - Haliburton Scout Reserve, Ontario, Canada. Ship 461's long cruise/super-activity for 2013 involved a week-long camp and sailing at Haliburton Scout Reserve located at Haliburton, Ontario, Canada. The Ship departed Souderton with one of our Catalina 22 sailboats on 12 July 2013 and we arrived at Haliburton on Saturday, 13 July 2013. We remained at Haliburton until 20 July 2013, at which time we loaded our sailboat back onto its trailer and headed for home. Pictured above, from left to right, are Pattie B. Guttenplan, Ship Committee Member; Randy van der Kleut, Administrative Mate; Andrew L. Cowles, Program Mate; Walter C. Coyne, Jr., Ship's Boatswain; Aaron Guttenplan, Ship's Purser; Sean van der Kleut, Ship's Yeoman; and Timothy P. Wile, Skipper. A pictorial record of our time at Haliburton, Canada, can be viewed by clicking on the heading above the group photo. 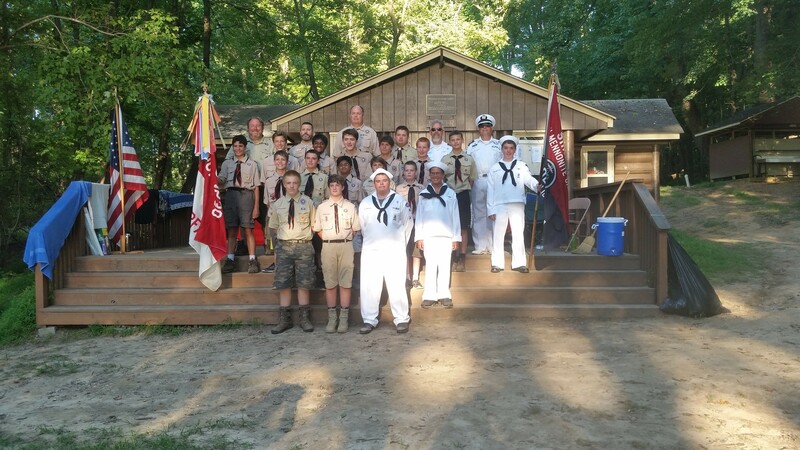 Ship 461's long cruise/super-activity for 2014 was a week-long camp to Rodney Scout Reservation on the Chesapeake Bay in Maryland during the week of 27 July through 2 August 2014. We took one of our sailboats, a 22 foot Tanzer, owned by Ship Administrative Mate Paul Coaché, to Rodney for the week. We launched the Tanzer at nearby Elk Neck State Park and sailed it to the Rodney Sailing Base, where it was moored for the week we were in camp. It seemed as if news of our sailboat spread fast amongst the Rodney staff as most of them were aware of the Sea Scout unit that was coming with its own sailboat. The staff at Rodney was most helpful in securing a mooring spot for our sailboat and with the use of their boats during our week there. We were originally supposed to share the Bayview campsite with Boy Scout Troop 91 from Harleysville, but a week or so before camp we discovered that we were assigned to share the Pioneer campsite with Boy Scout Troop 1530 from Fairfax, Virginia. Troop 91 ended up sharing the Bayview site with a Scout Troop from Bethlehem, Pennsylvania. Fortunately, the Pioneer site was right next to the Bayview site so we could visit with our friends from Troop 91 as well as make new ones amongst the Scouts and leaders of Troop 1530. The Pioneer site featured four (4) Adirondack shelters for the Scouts, each holding six (6) Scouts, as well as a number of tents. There was a cabin to house the adult leaders. The photo above is a group shot of those of us who shared the Pioneer campsite at Rodney for the week in which we were at camp. As you can see, we were easily out-numbered by members of Troop 1530 in both Scouts and leaders. The Sea Scouts, from left to right, are Walter C. Coyne, Ship's Boatswain; Paul Coaché, Administrative Mate, Matthew Ranberg, Ship's Storekeeper, and Kyle Coaché, Ship's Boatswain's Mate for Program. Skipper Tim Wile was taking the photograph so he is absent from the group photo. A pictorial record of our stay at Rodney can be viewed by clicking on heading for this year's cruise. Rodney Scout Reservation is located on over 900 acres of rolling woodlands at the head of the Chesapeake Bay and boasts of more than a mile of frontage along the bay. Rodney has been in operation since 1923 and is operated by the Del-Mar-Va Council of the Boy Scouts of America. The camp is located in Cecil County, Maryland, and is a short distance from Interstate 95 and Maryland Route 40 in the town of North East, Maryland. Boy Scout Troop 461 spent its 2006 summer camp at Rodney. 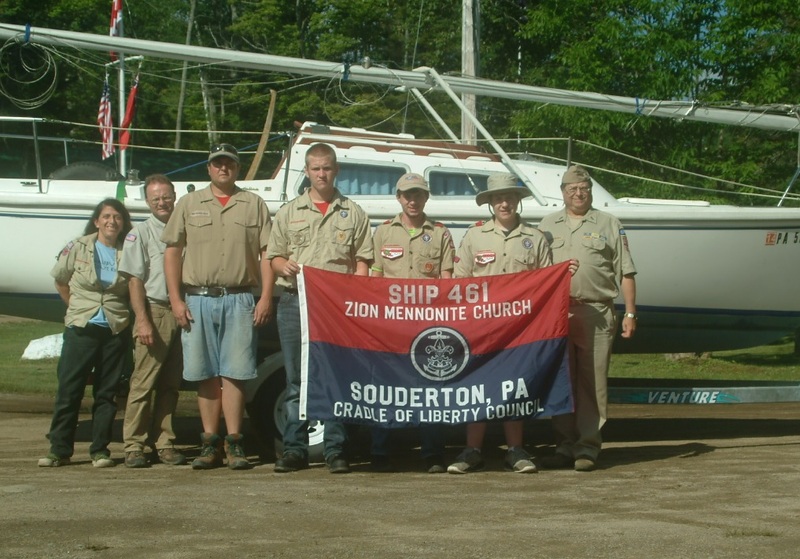 Once again, Ship 461 held its annual Long Cruise at Rodney Scout Reservation during the week of 26 July 2015 through 1 August 2015 and enjoyed a week of day-sailing and boating on the Chesapeake bay. Once again, we shared the Pioneer campsite with Boy Scout Troop 1530 from Fairfax, Virginia, with both Scouts and adult leaders enjoying the renewed friendships and camaraderie that we enjoyed the prior year. This year, the Ship brought two vessels to Rodney, both of which were moored at the camp's sailboat base. The two vessels making the trip to the Chesapeake Bay for this year's Long Cruise were the Skipper's Catalina 22, the Sharon Ann, and the Skipper's 14-foot Whirlwind runabout. The majority of our time on the water was in the Sharon Ann and the crew enjoyed several days of good wind and great sailing. On Wednesday we enjoyed 12 to 13 knot winds on the Bay and the Sharon Ann was simply flying through the water. We easily sailed between 40 to 50 miles during the week that we were at Rodney. The Sea Scouts also got the opportunity to drive the Skipper's Whirlwind runabout on the bay powered by a vintage 1958 Johnson 35hp Super Sea Horse outboard. While we were outnumbered once again by our land-based friends, the Sea Scouts were easily identified in the group photo below by their dress white uniforms. In the front row is Ship's Boatswain Matt Ranberg. In the second row is crew member Peyton Lugo. Holding the Ship's flag is Boatswain's Mate Kyle Coaché. In the row of adult leaders in the last row, from left to right, is Mate Paul Coaché and Skipper Timothy Wile. Following two great Long Cruises on the Chesapeake Bay while home-ported at Rodney Scout Reservation, the crew unanimously decided to hold Ship 461's 2016 Long Cruise again at Rodney. Once again Ship 461 will be sharing the Pioneer camp-site with Troop 1530 during the week of 25 through 31 July 2016. Our deposit has been paid and the Officers and Crew of the SSS Nautilus are looking forward to another week of sailing and boating on the Chesapeake Bay. This page last updated on Sunday, 02 August 2015.